Marvel vs. Capcom: Infinite only came out less than a week ago, but longtime Marvel players have been hitting the lab and putting together their teams. One player showed his prowess yesterday by putting up a perfect round. Richard Nguyen is no stranger to Marvel or playing Dante, a staple for him during the Ultimate Marvel vs. Capcom 3 era. For yesterday's Battle for the Stones tournament at the SoCal Regionals, Nguyen brought out Dante and Dormammu, and finished off a first round against opponent BT Clockwork in near-clinical fashion. 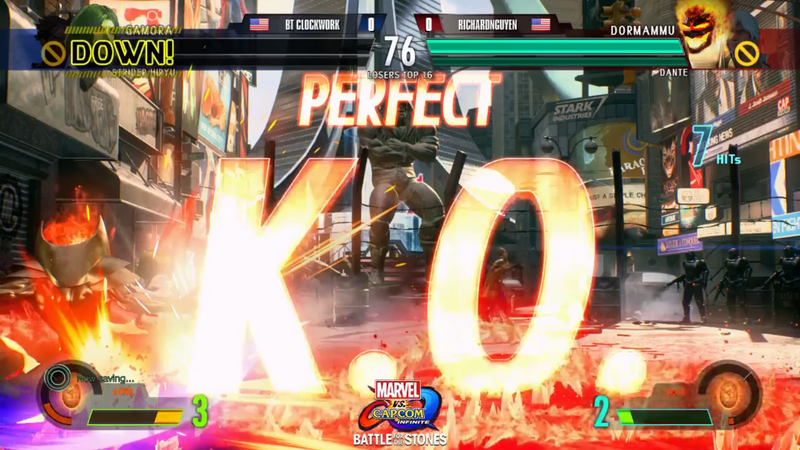 The clip isn't quite long enough to catch the start due to Twitch clip size limitations, but Nguyen is already showing some incredible prowess in Infinite, having eliminated Clockwork as well as a former Evo champ in Chris G.
Top 8 play starts today at the SoCal Regionals, where players will fight to see who takes home the first win in the Battle for the Stones circuit. You can check out the action on the Capcom Fighters Twitch channel here.